Neck pain is one of the most common types of symptoms experienced by the general population. Cervical spine complications can frequently occur due to a variety of injuries or conditions, however, neck pain has become increasingly common. Since the introduction of smart phones, tablets, and other devices, many individuals spend too much of their time looking down and over time, damage or injury can occur, a condition known as text neck. Text neck is a modern, cervical spine condition characterized by neck pain and discomfort as a result of constantly looking down at a technological device for extended periods of time. The symptoms associated with the condition most commonly include neck pain and soreness but other symptoms can include, upper back pain, shoulder pain and tightness, and occasionally, if a cervical nerve becomes pinched, it could cause neurological symptoms down the arm and into the hand. Generally, an improper posture is the source of the pain and other symptoms related to text neck. Habitually looking down at a phone or laptop in a slouching posture while the head is pushed forward can add extra pounds of unnecessary pressure on the cervical spine, constantly stretching the tissues of the neck, which can begin causing degeneration and wear and tear of the structures surrounding the cervical spine. Additionally, a cluster of nerves can be found between the space of the neck and shoulder and, if these nerves become compressed, misaligned, or damaged, the pain and symptoms can become disabling. To a greater extent, text neck is much more common among young people. As little as spending two to four hours a day hunched over a smart phone is enough to create a serious problem on the body over time. Although spending two to four hours may not seem like a long time, many young individuals may actually spend twice that much time every day. 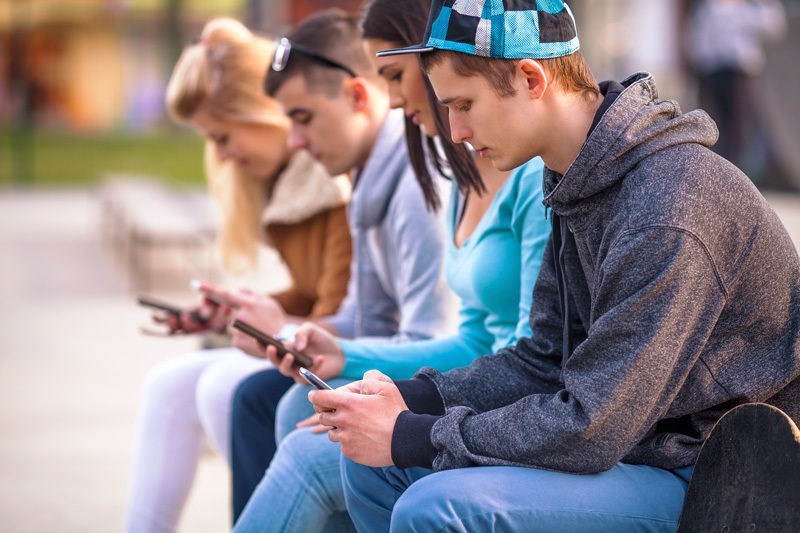 Considering the impact of the accumulative hours of bad posture in the time span of a year, is the reason teenagers are at a higher risk of developing text neck and further cervical spine complications. Furthermore, text neck in combination with a sedentary lifestyle can further aggravate the condition. Inactivity and an improper posture can cause other types of complications along the spine, such as back pain and muscle weakness, and if there’s a spinal misalignment, the nerves along the length of the spine may also become compressed. Fortunately, text neck can be corrected and if it’s diagnosed in time, the pain and symptoms can be avoided altogether. Practicing good posture and reducing the amount of time an individual spends looking down at their devices can be a good first step towards recovery. A chiropractor can also help treat text neck along with its associated symptoms. Through chiropractic treatment, a chiropractor may use spinal adjustments and manual manipulations as well as recommend a specialized set of stretches and exercises to strengthen the muscles surrounding the spine. Spine health is important for anyone who wishes to maintain a healthy lifestyle and preventing injuries or complications to their health is the key to improving your well-being, most importantly during the growth of teenagers, in order to avoid text neck from developing.